March 29th, 2019. A much-anticipated date, though one that now holds little meaning. At the most recent summit in Brussels, both the UK and the EU agreed to postpone Brexit, with the two new possible dates of exit laid out as 12 April, or 22 May. It’s been almost impossible to escape the ever-changing Brexit headlines since June 2016, and they’ve been anything but consistent. Not only is the general public in the dark on what’s to come, but so seemingly are the government themselves. The UK’s departure from the EU will have lasting impacts in an abundance of areas, and the financial services sector will be one of these affected most noticeably due to the UK's status as one of the global finance centres. The most widely discussed concern is the risk of no deal, but this is only the tip of the iceberg when honing in on the challenges that the UK’s banks and financial services will face. 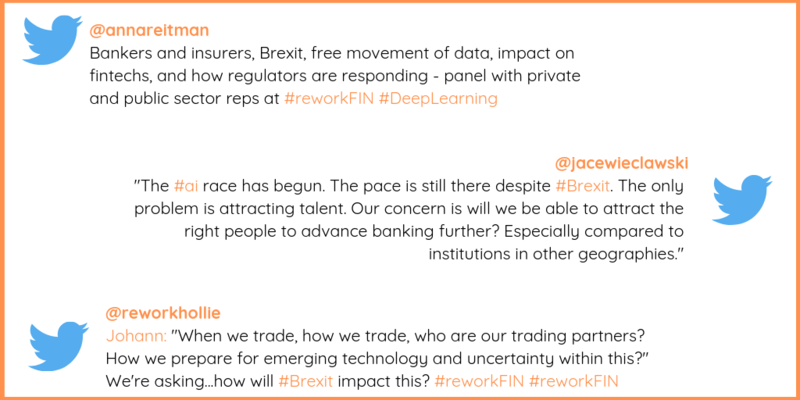 Last week at the Deep Learning in Finance Summit, experts working in technology, finance and government came together to explore some of the possible outcomes and challenges that the financial industry will face post-Brexit. The panel discussion focused on assessing the impact of Brexit on the development, diffusion, and governance of emerging technologies including Deep Learning and AI both within the U.K, on the European level and internationally. Joining the panel was Val Alsop, Artificial Intelligence and Data Grand Challenge Lead at UK Department for Business, Energy and Industrial Strategy; Johann de Silva, Deputy Head, Science and Scenarios at UK Department for International Trade; Jaya Handa, Privacy Director at Liberty Specialty Markets; Jacek Wieclawski - Markets Innovation/Future of AI in Financial Services, Working Group Member at Rabobank/World Economic Forum and the moderator of the discussion, Stefania Spezzati, Finance Reporter at Bloomberg. Val also stressed the importance of attracting global talent into banking and fintech in the UK to stay ahead of other countries and said that skills are a key area they’re addressing at the moment. On January 31st, the UK Department for Business, Energy and Industrial Strategy announced their new skills package which will offer PhD spaces focusing on AI where they bring people from across the world into the UK to try and address this challenge and close the gap. Want to hear more from the panel? Listen to the full discussion here. Where do you think Brexit will have the biggest impact? Let us know in the comments.